I loved using Happily Unmarried Face Wash and bought Happily Unmarried Face Scrub Dry to Normal Skin right after to try it out too. 1) Happily Unmarried Face Scrub Dry to Normal Skin comes in a sturdy flip top tube that is spill proof and makes this face scrub easy to carry around anywhere. 2) I have come to love the quirky quotes on the Happily Unmarried products and this one is no exception. "Get Clean Before You Get Dirty" is what you get on the tube of this product. 3) A branded product, it is chemical free - contains no Parabens and SLS. 4) Natural, skin friendly components like Vitamin K, Pomegranate and Sub Arctic Bearberry extracts make the ingredients list. 5) It is a cream based scrub that gently cleans the face without harming the skin. There are tiny granules in the cream that gently scrub off the dead skin leaving behind a soft, clear and healthy face. 6) Only a small quantity is required per application. 7) I love the fragrance of this scrub that is subtle and leaves a lingering smell behind without causing irritation. 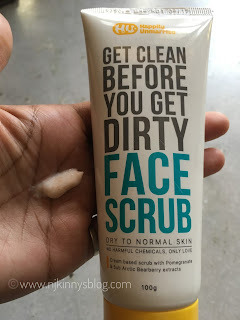 8) Suited to dry and normal skin, I didn't face any allergic reactions using this scrub. 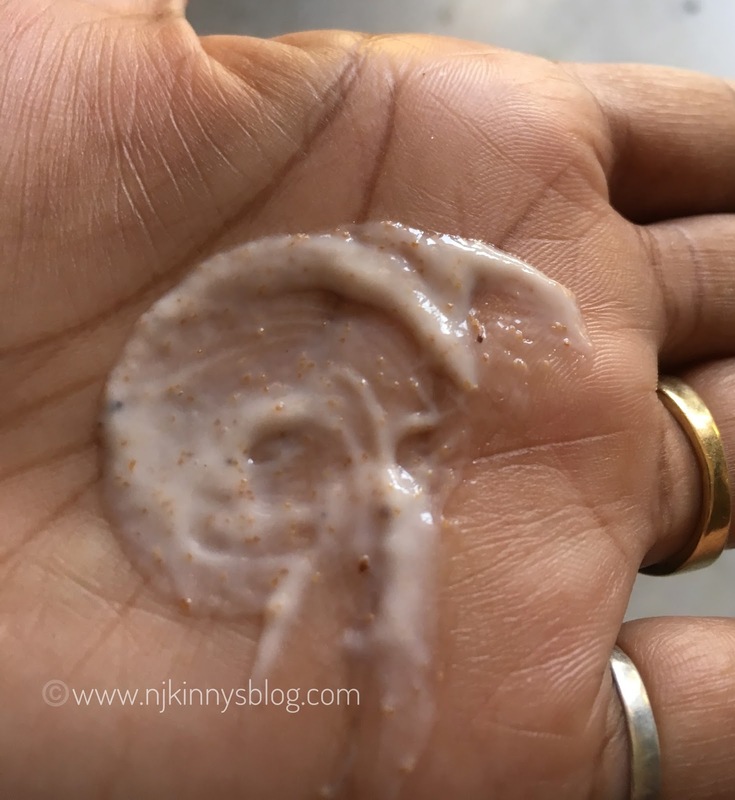 9) It exfoliates, removes whiteheads and blackheads and also moisturises the skin and has even toned my skin to a shinier, more healthier variant. 10) I have seen my tan lessen and skin is feeling more soothed ever since I started using this scrub. 11) It is so gentle that one can use this scrub every day. 12) The shelf life of 24 months is adequate for using this product. 1) The only thing that will cause a slight hesitation will be its pricing of 350 INR for 100 ml which is slightly on the higher side as compared to the other face scrubs in the market but still everything considered, I would recommend you keep a lookout for lightning deals and don't miss out on buying this product. 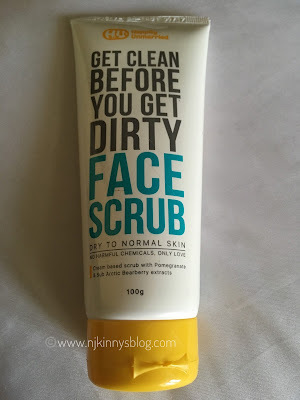 All in all, Happily Unmarried Face Scrub Dry to Normal Skin is a great product and Njkinny recommends it to everyone with dry and normal skin.